Love it or loathe it, there's no denying that Call of Duty is the winter's biggest game release. Literally millions of players pick up the latest instalment on it's November release date every year, and with developers Treyarch taking a year's break after Black Ops, it's time for Infinity Ward (or what's left of them) to bring back Modern Warfare. 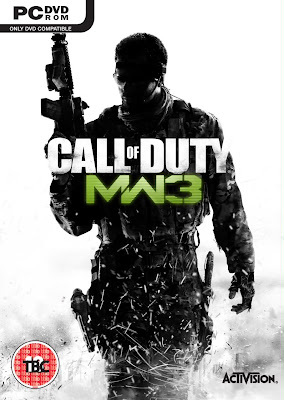 While still officially unannounced, loads and loads of details regarding Call of Duty: Modern Warfare 3 have been blown open in the last couple of days; any new information I can find will slowly be uploaded to this page. At the moment, the legitimacy of box art is unconfirmed. While it is very likely that this is the official box art, however a couple of things stuck me as odd: a BBFC TBC rating already; a BBFC rating at all (I would have thought it would be a ESRB rating being an American-produced game); the use of only the initials rather than the complete 'Modern Warfare' title; and the fact that the released box art is for the PC when Call of Duty's primary console has always been Xbox 360. Just a couple of little niggles made me think it may not be legitimate, but the majority of the internet seems to believe this is the real deal, and by the quality of the box, I could believe it too. Four official MW3 teasers have been uploaded to the CALLOFDUTY YouTube channel, the release of which was supposedly 'unplanned'. The trailers include various soundbites of dialogue and action-packed explosion sound effects and tease four different cities, presumably where the played will be fighting during the games campaign.